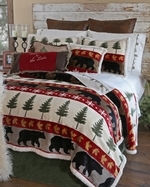 Celebrate the your Lake, Lodge or Mountain home with our Tall Pine bedroom. The set is a breath of fresh air. Rows of grand pine trees stand faithfully against a peaceful backdrop of fluffy white, while sleepy bears scout for a hibernating home. 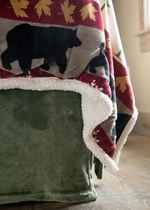 The plush comforter, with soft faux shearling, provides snug protection even on chilly nights. Add matching throw, valances, sheets, and throw pillows to further elevate your décor and enjoy your reprieve amid the Tall Pine! Twin - Bedspread 68" x 89", Bed Skirt 39"x75"x15", Sham 20"x26", Pillow 18"x18"
Queen - Bedspread 92"x96", Bed Skirt 60"x80"x15", Two Sham 20"x26", Pillow 18"x18"
King - Bedspread 110"x96", Bed Skirt 76"x80"x 5", Two Sham 20"x36", Pillow 18"x18"